1. Sickles (2-14*) – The dreaded asterisk. The elephant in the room. The forfeits. We get it. But we still think the Gryphons are the team to beat. Prove us wrong. 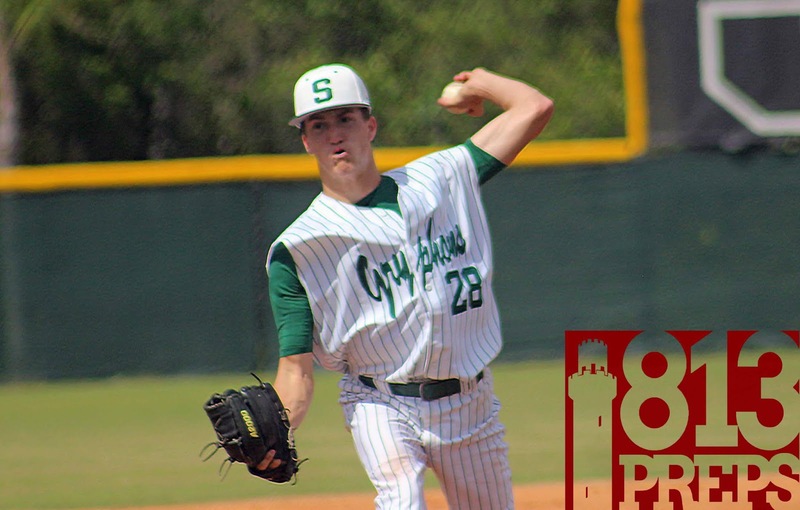 Sickles responded to having to forfeit 12 wins due to a falsified address of a bench player, by winning by double digits over Freedom and Plant, the latter of which was led by six shutout innings from sophomore Holden Wade. Wade, the Gryphons No. 3 has won four games on the field, averaging a strikeout per inning. Sickles hosts Alonso on Tuesday and travels to Hillsborough on Thursday. 2. 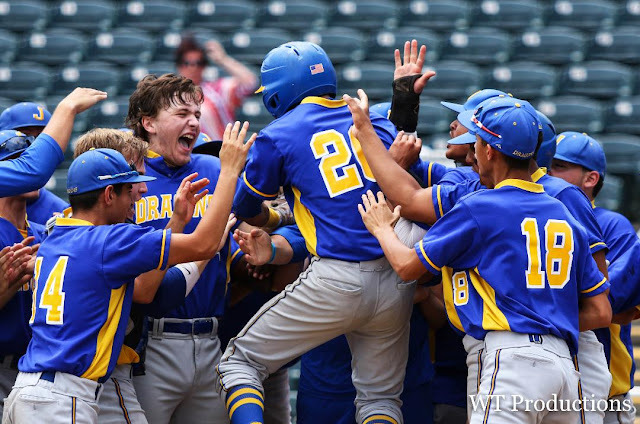 Jesuit (16-2) – The Tigers are rolling, having won seven-straight including district victories over Blake and Spoto last week, as well as a 4-1 win over Tampa Catholic on Saturday (click here to view Mike Camunas’ photo gallery from this win). Apparently, junior Bennett Lee didn’t like when we labeled him a “double’s machine” a few weeks back, so he started collecting triples like they were baseball cards, recording six three-baggers in as many games. AJ Karabenick, Tripp Russo and Dominic Castellano led the way in the 9-0 win over Blake, allowing a total of two hits and striking out 16. District road games at Robinson and Jefferson this week for the Tigers, who are 8-0 in Class 6A-District 8 play. 3. Plant City (16-2) – The Raiders only had one game this week, being tested by Riverview, but came out a winner as senior Parker Messick’s 13 strikeouts and shutout pitching led the way to a 1-0 win. Plant City looks to avenge its lone district loss when it travels to Bloomingdale on Tuesday, as both teams are 5-1 in Class 8A-District 6, and the Raiders have a game against East Bay to round out the week. 4. Wharton (15-2) – Jackson Perkins and Carson Caso handled business on the mound, combining for eight strikeouts as the Wildcats stayed hot with a non-district win over Plant last week. But in a district game against Freedom it was once again the Brian Baughman show. Baughman is now 6-0, tossing four complete games, with a 0.36 ERA, and has 55 K’s in 39 innings. A visit to Steinbrenner and a district game with Strawberry Crest is ahead for the Wildcats this week. Wharton is 5-0 in Class 8A-District 4. 5. Leto (14-4) – The Falcons move back up the list taking care of things in a pair of district games with Hillsborough and Gaither. 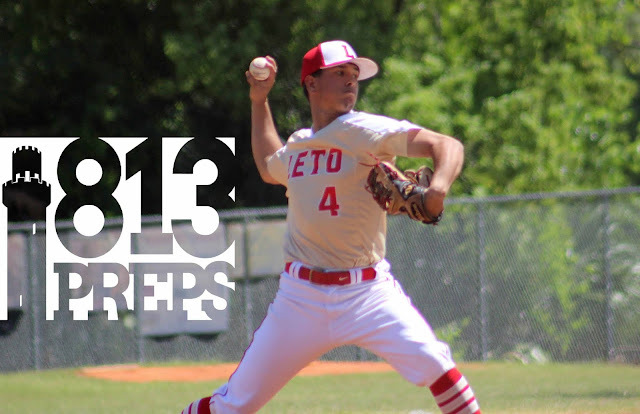 It was the second of these that might have been the most impressive as Leto fell behind five runs to the Cowboys in the first, but battled it out for a 9-6 victory. Senior Javy Hernandez came up big in the win, with a 3-for-4 game at the plate and two shutout, no-hit innings of relief on the mound to earn the victory. Leto travels to Freedom on Tuesday, and hosts King on Thursday. 6. Steinbrenner (12-3) – Steinbrenner claimed wins against Bloomingdale and Tampa Bay Tech, but dropped a tough game to Armwood last week. In the win over the Bulls last Wednesday, senior Mikey Mullins hit his second homer of the season, in his 3-for-5, five-RBI night. The Warriors moved to 3-0 in Class 8A-District 5 play thanks to the Sickles forfeits and find themselves at the top seed in the upcoming tournament, and automatically qualified for region play. Steinbrenner host Wharton on Tuesday, take on Carrollwood Day on Wednesday, and has another tilt with Plant on Thursday. 7. Lennard (13-3) – The Longhorns were not happy booting a big lead and dropping a heartbreaker to Riverview on Tuesday, but Lennard regrouped and finished the week impressively, crushing district opponent Braden River to lock up the top seed in Class 7A-District 9, then followed with a win over Strawberry Crest on Saturday. Senior Cameron Lassalle led the way to the win over the Chargers (click here to read) with a big relief outing on the mound. 8. 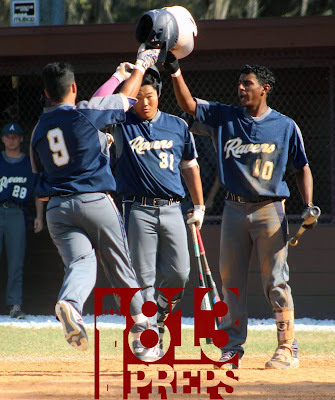 Alonso (9-6) – The Ravens defeated Gaither, then locked up the Class 9A-District 8 tourney top seed with an 8-7 win over Palm Harbor last week. Sophomore Renzo Gonzalez hit a walk-off homer to key the win over the Cowboys, and then also hit a home run against the Hurricanes. 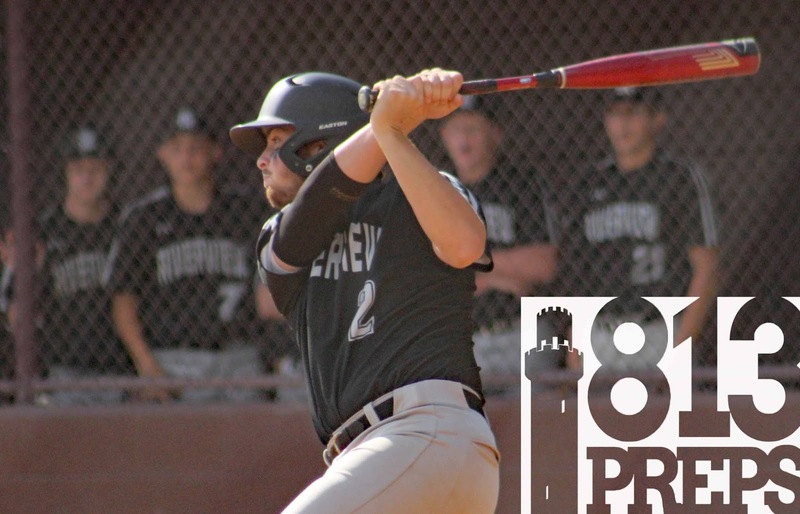 Senior Drew Lara doubled in the deciding run in the top of the eighth as the Ravens defeated PHU in extra innings on Thursday. Alonso gets tested at Sickles on Tuesday, and looks to avenge an ugly district loss to Sarasota Riverview in the team’s second regular season meeting with the Rams on Thursday. 9. 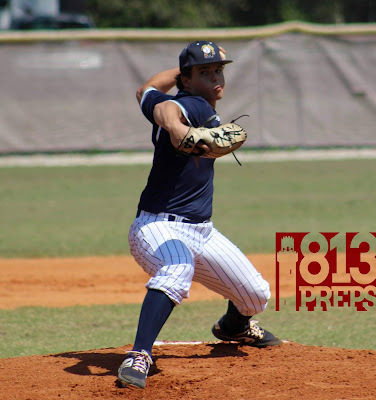 Berkeley Prep (12-5) – The Buccaneers have battled all season and finally crack our Top 10 rankings after beating district foe Tampa Prep and Seminole last week, before dropping a tough 9-6 loss to Calvary Christian. Berkeley Prep is 8-2 over its last 10 games, and junior Ian Brown improved to 4-2, striking out 10 in the win over Tampa Prep. The Buccaneers host district opponent Tampa Catholic on Wednesday and Live Oak Suwannee on Thursday. T-10. Bloomingdale (12-5) – The Bulls’ week started out with a district win over East Bay, but bottomed out with losses at Steinbrenner and a 1-0 defeat to Durant on Friday. Aside from the pitcher’s duel on Friday, Bloomingdale’s offense is not the issue as the Bulls are hitting .322 as a team with 100 RBI and 18 home runs lead by nine from Brock Wilken and five by Kyle Merkle. Two huge district games against Plant City and Riverview are on the schedule this week for the Bulls. T-10. Riverview (11-6) – The Sharks mounted an epic comeback after falling behind nine runs against Lennard (click here to read about it), then got a district win over Durant, and pushed Plant City to the limit before falling 1-0. 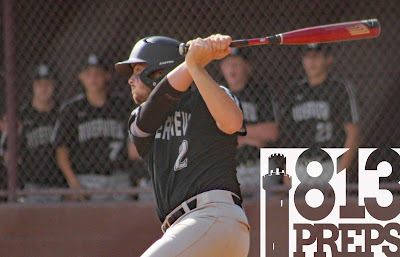 Riverview has been hit hard by the injury bug this season, which includes having to go the rest of the way without senior pitcher Ty Correa due to a broken hand, but the Sharks have battled all year as Mac Jorgensen (22 runs) has set the table as lead-off man, and Brendan Herrick has driven in 20. Riverview travels to Strawberry Crest on Tuesday and hosts Bloomingdale in district play on Thursday.